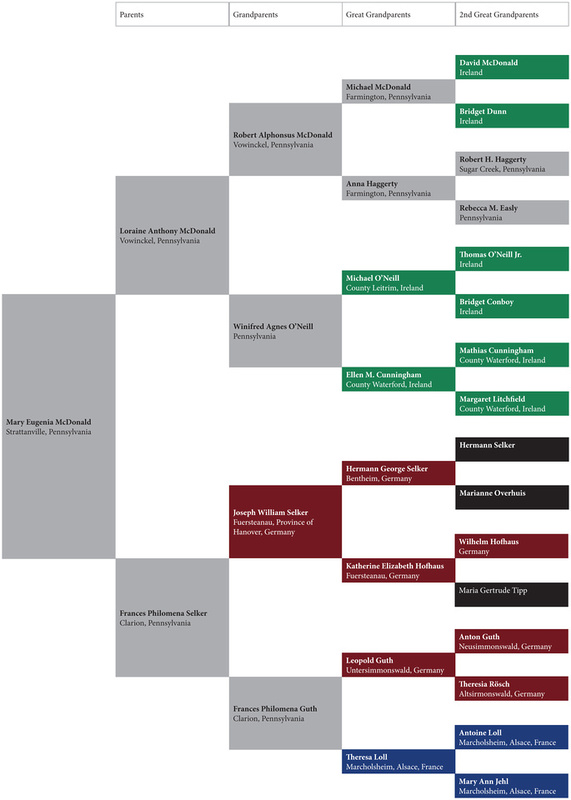 The five generation pedigree chart below showcases Mary Eugenia McDonald with four generations of her direct ancestors. The color coding is used to group the birthplaces of the featured individuals. If the birth location is unknown black has been used. This format has been adapted from the original version shared by genealogist J. Paul Hawthorne. The oldest ancestor featured in the chart is Anton Guth born 1792 in Untersimonwald, Margraviate of Baden, Holy Roman Empire. His 2nd great-grand daughter Mary Eugenia McDonald was born 130 years later on January 22, 1922 in Strattanville, Clarion County, Pennsylvania. 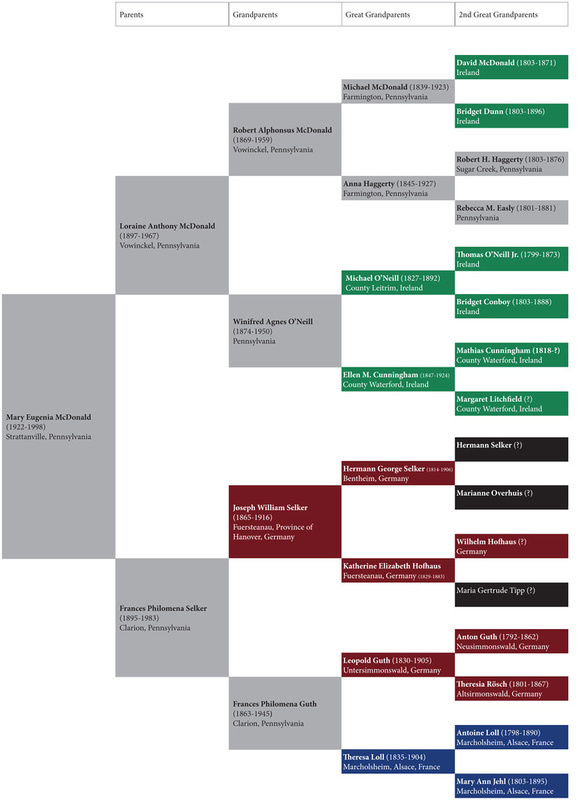 As shown from the chart the ancestors of Mary Eugenia McDonald arrived over several generations. David McDonald and his wife Bridget Dunn are first documented in Clarion County in 1833. David and Bridget traveled with their son James most likely arriving prior to 1833. They may have traveled with other family members as well. Robert Haggerty is the son of Irish immigrant Thomas Haggerty. Thomas Haggerty arrived in the late 1700's with his first wife and at least one son named John. Rebecca Easly is a descendant of the Kuhn and Easly families. These families were living in the United States prior to the Revolutionary War. Michael O'Neill arrived in the United States May of 1851. Several of Michael's siblings also relocated to the United Sates. Ellen Cunningham arrived in the United States June 1869. She traveled with her parents and her siblings. Joseph William Selker arrived in November 1885. Joseph set out alone seeking opportunity. He would eventually return to Germany and bring two of his nieces back with him. Leopold Guth arrived approximately 1850. Leopold and his brother Francis Xavier left Germany together and settled in Clarion, Clarion County, Pennsylvania. Theresa Loll arrived with her mother and sibling on October 7, 1852. Her father Antoine may have traveled ahead as he was not recorded on the ship's manifest. An additional chart is also shown that includes the birth and death dates for the featured individuals. Mary Eugenia McDonald is my paternal grandmother. The individuals featured in the chart are my direct ancestors.